Now, I know this is probably tough to see. If you’d like to really explore this in high resolution click here. This was posted by reddit user jmerlinb. The infographic breaks down the screen time of 212 (anyone else not realize there are even that many?) characters by the house or category they belong to. 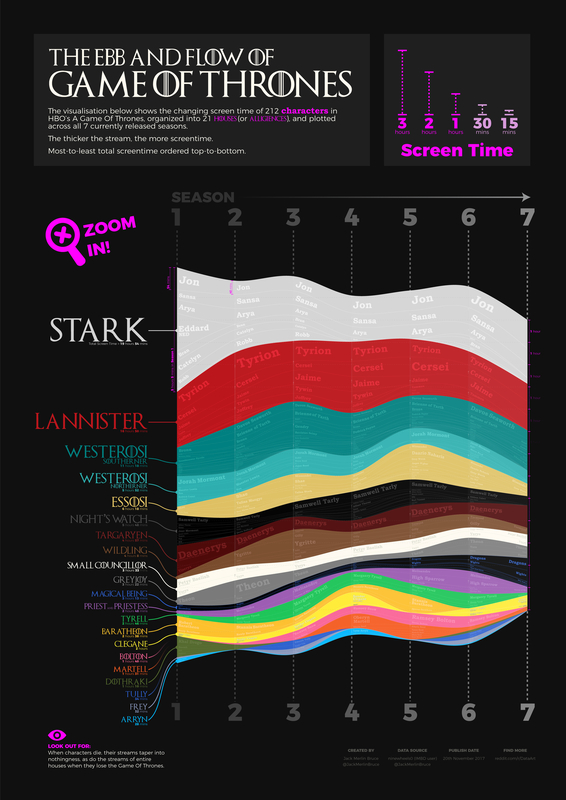 Clearly the Starks take the lead with Jon as the Stark (or Targaryen) with the most screen time. Next is the Lannister’s with Tyrion having the most screen time. I’m noticing a pattern here that my favorite characters are featured the most and now I’m wondering if I only love them because I see them often. Is this how love works? Nah, they’re just amazing and even the directors think so. There’s lots of debate (obviously) going on in the reddit thread about whether or not Jon should remain in the Stark category. Many believe his name should just jump down to the Night’s Watch and again to the Targaryen’s. I think that’s all unnecessary. Once a Stark, always a Stark. What do you think? So you may or may not remember in the first scene of the Harry Potter and the Sorcerer’s Stone film where Dumbledore and Professor McGonagall wear cool, pointy wizard hats as they walk through Privet Drive. The same hats are spotted again amongst the crowds at Diagon Alley, among teachers at Hogwarts, and most iconically, on the students in the Great Hall at the end of the film where they throw them up in the air. As one Reddit user said, “They threw them up into the air and forget them.” That’s exactly what happened. The fashion of Hogwarts slowly deteriorates as the films progress with McGonagall losing her hat and even the holy trinity of Harry, Hermione, and Ron abandoning their robes by the final film. What is the deal with the small, but consistent deterioration and forgotten fashion staples of Hogwarts? The author herself tried to explain away these inconsistencies in the hats of Hogwarts, but I’m just not convinced. “Standard wizard clothing comprises plain robes, worn with or without the traditional pointed hat, and will always be worn on such formal occasions as christenings, weddings and funerals.” Rowling also noted that the pointed hats are a “matter of cultural pride.” If they truly are, then explain to me why even the most anti-muggle witches and wizards are seen without them on a regular basis. A very apparent inconsistency of hats in the films is clearly seen at the wedding of William Weasley and Fleur Delacour in Harry Potter and the Deathly Hallows: Part One. All but one of the wedding’s attendees are wearing hats. ONE. If we’re still going by the rules as explained by Rowling, all of the wedding’s attendees should have been wearing their hats. As absurd as they may have looked, they are supposed to be a crucial part of a witch or wizard’s attire at weddings. The only way to truly find out what happened is in J.K. Rowling’s next book, Harry Potter and the Return of the Wizard Hats. Every reader knows the harrowing, anxiety-ridden, and time-consuming process of choosing their next read. As a bookworm myself, I have stacks (and I mean stacks) of books that I can’t wait to read. Some people may call it hoarding, but I simply call it collecting worthy books. So yes, there is no shortage of books to read, yet selecting a single book among hundreds can be really freakin’ difficult. Luckily for me and other struggling readers out there, Reddit users are offering their effective methods of choosing the next book to open. Comment from discussion How do you choose your next book?. Reddit has become a huge, expansive website bringing together the best and worst of the online world. With as many subreddits as our collective conscience can create, the website ends up being exactly what you make of it. Between the politics and the memes, there are some incredible subreddits for writers and readers, and r/NoSleep is one of the best. Especially if you’re searching for spooky stories. If you’re unfamiliar with the subreddit, r/NoSleep is a place for authors to share their original horror stories, and suspension of disbelief is hugely important. Everything is true, even if it’s not. I’m going to attempt to give you a short description to each without giving anything away, because that’s just the worst. The narrator lives next door to a YouTube star, who goes out of town for a few weeks and asks the narrator to pick up his mail while he’s away. What starts as a routine class assignment turns…darker, in spite of the student’s mother’s concerns. A father reads his daughter a bedtime story, despite not recognizing the book she chooses. Shenanigans occur. Have you seen the movie Unfriended? If you like this story, you should definitely watch Unfriended. As a child, the narrator receives two teddy bears following her grandfathers’ deaths, naming one Fran and the other Jock. As an adult, the narrator house sits for her parents, and things get a little spooky. If you think you’ve got what it takes to make it to the top of r/NoSleep, start submitting! Gather those sweet, sweet upvotes.